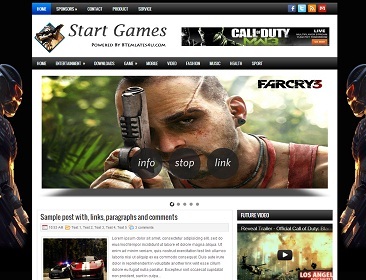 Descriptions : Free Start Games Blogger Template is a another game related blogger template. its`2 columns with 3 columns footer, 1 right sidebar, beautiful 3D slider, nice background, social bookmark icons, jquery top nav menu, eye catching look, high quality theme, fast loading, seo optimization, blue, white, black, colors with more futures available blogger template. This blogger template good for games blogs.